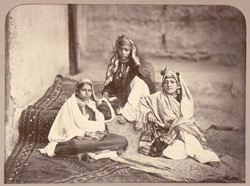 Photograph of three nautch or professional dancing girls, taken at Kabul in Afghanistan by John Burke, c. 1879-80. Burke accompanied the British army into Afghanistan in 1878 and worked steadily in the hostile environment of Afghanistan and the North West Frontier Province, recording military and topographical scenes as well as the peoples of the country during the Second Afghan War (1878-80). Burke also photographed many darbars or meetings that took place between British combat leaders and Afghan chiefs which led to the uneasy peace treaties characteristic of the campaign. His two-year Afghan expedition produced a visual document which resulted in his achieving significance as the photographer of the region of the Great Game (the Anglo-Russian territorial rivalry). In the winter of 1879, through to the summer of 1880, the British force called the Kabul Field Force occupied Kabul. Its commander General Roberts was tasked with securing Kabul and maintaining lines of communication via the Khyber Pass with the rest of the British forces, meanwhile negotiations to bring an end to the war and place a new Amir on the throne of Kabul were going on. Burke took a series of images of the occupation of Kabul, and among the most interesting are his portraits of the city's different citizens, such as this portrait of nautch girls.